Disclosure: This is a sponsored post. All opinions stated are genuine and my Emeril-Lagasse-shoe-loving-own. These Emeril Lagasse Shoes have revived my achy, tired feet! Before I became a stay-at-home mom, I worked in a place where business attire was required. I didn't mind at all. My fashion sense was keen and dropping a few hundred dollars on a pair of high heels didn't phase me in the least. Quality was needed for my heels because I lived in them. I remember trekking around Europe and even Las Vegas (where there is a lot of walking) in high heels without even being phased. Fast forward to my new life, and things have changed. A lot. Not only am I older (high heels and older age don't seem to go so well together for me), but I also now have a job where the pay is not enough to drop a few hundred $$ on shoes (are you kidding me? Not happening) and I stand on my feet 95% of the day (ahh to that 5% when I get to sit at my desk), primarily on a concrete floor. By the end of the day, my feet hurt! Heels for this job were never considered, and I quickly learned cute flats weren't going to do the trick, nor were cute flats with any of the batrillion types of insoles I purchased in an attempt to find comfort. So...what's a gal to do? Research!! I got a great list of shoe types to consider from a fellow blogger who did the same kind of work I do (thank you, Susan..visit her blog,The Contemplative Cat) and my oldest son reminded me of how comfortable his Emeril Lagasse shoes (yes, that Emeril) are for him at his job. I wrote about those here. I remembered that they do have women's shoes too, and out of curiosity, I headed over to the website. Oh sweet victory, they had shoes that would work with the casual dress code required where I work. There are no ties to these shoes, so they can't be considered too casual (yes, that's a thing where I work). They have elastic stretches at the top, to make it easy when you're putting them on and taking them off, while still allowing you to have a comfortable fit. There is a pull on the back too, if you like to hold on to that while you put these on. I've not had to use the back tab, but it's handy if you need it. There are a few choices for women on the website, and I selected the Cooper Pro shoes in black (they also have white) with agion antimicrobial technology, which constantly resists microbe growth. I thought these would go best with my dress pants, and they do. In fact, I predict I'll be wearing black dress pants quite a few times this year, just so I can have these shoes on my feet all day long. And that padding you see is built-in memory foam. Ahhh, how I love built-in memory foam. This little perk makes all of the difference in the world for me in either coming home, making dinner, and sitting on the couch to fall asleep (not wanting to, but it just happens), or coming home, making dinner and having the energy to want to play a game, watch a little TV with my boy, or take a walk instead. It is no secret that tired feet wear you out, so finding a pair of shoes that allows you to make the maximum of your awake time, both during and after work, matters a lot to me. The official name of the foam? Balanced Active Movement Memory (or BAM!) Foam Insoles. You knew it was coming. :) The molded EVA mid-sole provides maximum support to help battle fatigue, and it works like a charm. Now let's talk soles. Emeril shoes all have a grooved-sole bottom that is slip-resistant. Why would that be important at my job? Well, there are several instances I can name, but one that instantly comes to mind is running. Yes, teachers run, though I never advise doing it. Last year during the state testing, we gave our students tickets in the computer lab if they remained focused during the entire battery of tests, that would admit them to the gym afterwards for a celebration party. No ticket, no party...no exceptions. At the end of the tests, I escorted my students back to the classroom and promptly remembered that I'd left their tickets in the computer lab, 2 buildings away!! I got a class sitter and took off running (time was of the essence, they were getting ready to go to the gym). It was raining outside, but I didn't have to worry about that, there was a concrete overhead to keep me dry. Never mind that, others had come in from the outside, and the entryway, despite having a large rug was wet. In my lightning speed state of running (just humor me while I insist I was running at a speed to rival FLASH), I ate it, big time. The dean and another teacher he was meeting with rushed out of their office, because of course their door was open and they witnessed the whole thing. There was not time to waste though, so I assured them I was okay as I got up and started running again (something I'd never let my students do), telling the two left in my dust to not replay that tape and laugh over the summer. ;) The thing is, I had on shoes that got slippery when it was wet!! Had I had these on, albeit I shouldn't have been running, perhaps I wouldn't have fallen down. I have other 'oops, I fell down!' stories, because I tend to be a go-go-go person, but I'll spare you (and now that I think of it, I'll be more careful). Two more quick but important points to make, and then we'll get to the giveaway. These shoes are also water and stain-resistant, as well as odor-resistant. I love them. They have revived my sleepy, achy feet and allowed me to have more time with my son once the work day (and his school day) is done. Huge accolades, and a high recommendation from me to you if you're in the market for comfortable shoes!! There are currently 10 styles for women to choose from, all with the amazing properties discussed above for my shoes. One lucky winner gets to choose the style they want, to call their own. US entrants only. It has something called agion. Agion is designed to automatically release its antimicrobial components when conditions for bacteria growth are present. What a great idea. All high grade materials used in making them. This is my type of shoe I love them! i love the different styles, especially the ones that resemble the converse style. After looking at the styles I like the Julia one and would pick that if I win. I love the designs. Especially the WOMEN Juliaj shoe. I like the different types. 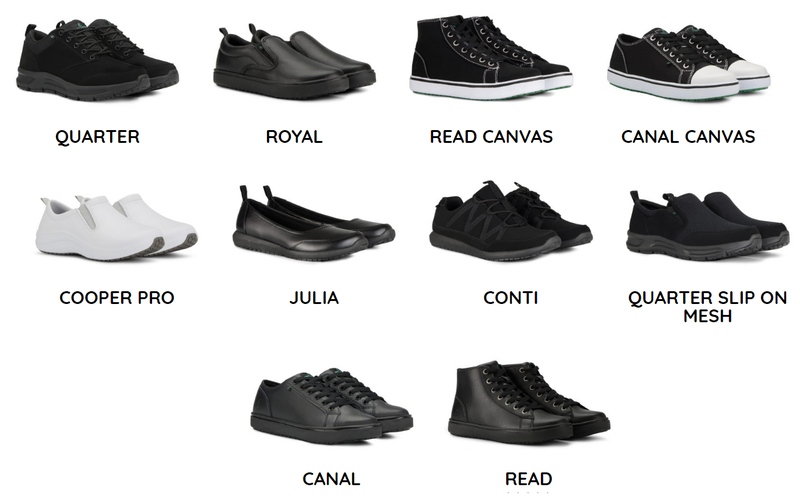 My favorite is the WOMEN Julia shoe. I like the Royal design! I learned that an Agion® anti-microbial breathable lining is added to the shoes to help keep feet fresh. I learned that their extra comfort midsole provides superior cushioning and added rebound to help protect the foot and provide maximum support and stability. I learned that the extra comfort midsole provides superior cushioning and added rebound to help protect the foot and provide maximum support and stability. I like the WOMEN CONTI shoe. They are wonderful to wear. I learned that the Emeril footwear line of slip resistant work shoes was established to support hospitality employees who work long hours on their feet. I learned that Emeril Lagasse and Jack Schwartz Shoes formed a partnership to design shoes for restaurant workers. I like the Julia shoes. They look comfortable and stylish. I work within the hospitality industry and it looks like Emeril Lagasse has many styles I could wear for work. I like that the shoes have a comfort insole for support. I like the WOMENS CANAL. I have nerve damage in my leg and foot so it is hard for me to get shoes on. But with zipper they will be perfect. I like the woman's Canal shoe. I learned that all of Emeril’s Footwear ulitlizes AllShield water resistant hydrophobic spray that is applied to the surface of the shoe to provide stain and water resistance. I really like the Julia shoe. I could really use a pair of flats. That built in memory foam sounds super comfy! They look like some great shoes for the ladies who are on their feet all day long! I did not even know that Emeril Lagasse had a shoe brand. It is very well rounded with quite a few great looking shoes for comfort and style. That they have black tennis shoes, which I get to wear to work. I learned the shoes have a lining to reduce odor!!!! I like that their shoes have and odor-resistant lining. That's great for when you're on your feet all day. I love the Julia shoes on their site. They look like they can be worn with dress up clothes, or jeans. Perfect! So many styles to choose from! I would LOVE to win this great prize! I learned they have a lot of cute shoes on the website and that they do free shipping. I learned that their uniquely constructed molded EVA mid-sole does the job of balancing comfort, durability, “springiness”, and light weight performance. Thanks. The Canal Canvas shoes are actually really cute! I like the Women’s Quarter Slip On Mesh. i like the cooper pro shoes. I learned these are slip and water resistant. These shoes are designed for people who work on their feet. Except that they are the wrong color, I wish they had been available when I was working clinical. I like the variety of styles, but I think the Royal style is the one I would try first. I like the Julia shoes! I learned that the shoes are slip, water, and odor resistant. I like the Canal Canvas shoes. I had no idea there were so many cute styles. I have sciatica and some other nerve damage in my back that causes my heels and legs to hurt. My mother has spurs and needs new shoes to. These seem like they would be great for us both! i like that they have an antimicrobial lining to keep your feet fresh and clean. these are nice shoes. I like the Julia style a lot! They have some cute styles. I like that the Read looks like old school Doc Martens! These look mighty comfortable, Great price, too! WOMEN's COOPER PRO are sharp! I like slip on's! I learned they offer a LOT of black colored shoes. I like the Julia style. I like that the Women's Conti type provides a sock like comfort. I like the Conti women's shoes. These look great, my feet always hurt at the end of the day! I really like the Quarter Slip on Mesh shoes. I would love these shoes! They go with everything and are easy slip off and on. Being in the hospitality industry, I need a good slip-resistant shoe. I learned that these shoes exceed the industry testing standards and also are above the industry average for oil and water slip resistance. These would definitely be great for my job. I like the women's Quarter style. That they have an Agion® anti-microbial breathable lning...a very good thing! I love the quarter style !! I learned that the shoes have a memory foam insoles that give your feet the support they need. Chef Emeril Lagasse and Jack Schwartz Shoes Inc. began a partnership to produce a shoe line for professionals in the restaurant industry. I like how they have different width sizes! I learned that Emeril has a new footwear line - who knew. Great slip resistant shoes made specifically for their anti-slip nature, perfect for employee safety. Great idea Emeril. I love that it gives you the option of "leather" or "vegan". I like the Julia shoes which looks so comfy. The ALLSHIELD system repels water and food. From what I read these would be perfect for my daughter. She is getting a culinary degree. I learned that the shoes have AGION® TREATED BREATHABLE LININGS REDUCE ODOR, KEEPING THE PRODUCT FRESH FOR AN EXTENDED TIME! I learned the shoes are treated with AllShield® a breakthrough technology that repels liquids and food. I love the assortment of fashionable styles. I love the Cooper Pro. They look super comfy! I like that these come in wide sizes. I love that they have free shipping with $50 and up orders! I like that it is slip resistant. I love the Julia shoes. And i love the style and comfort all these shoes provide. I learned that Agion is designed to automatically release its antimicrobial components when conditions for bacteria growth are present. I learned that the line has advanced slip resistance technology . I liked the MEN COOPER PRO shoes. I like non-slip shoes. They don't make shoes like they used to and I find the soles for many shoes to be very slippery, especially in the rain. So I look for non-slip footwear for everyday wear. I like the looks of the JULIA shoes. I learned that they come in 4 types of materials.